Most everyone agrees that the Outer Harbor should primarily be set aside for parks and recreation. This includes the Erie Canal Harbor Development Corporation, as well as local preservationist, environmentalist, and planning activists. But as with any proposal that has even minimal complexity, there is a Buffalonian blood feud brewing when it comes to the issue of development. For over half a century, the people who run the airport, buses, and trolley also owned the land on the Outer Harbor. It fell into decay, disrepair, and parts of it were an environmental catastrophe. Anyone who cared agreed that the land was being poorly managed, and that it was a squandered opportunity. In just the last few years, all that has changed, but it hasn’t been easy. For instance, when improvements were made to access the Outer Harbor in recent years, the same people now fighting the idea of construction on the outer harbor were railing against enhancements to access it, claiming silly things, e.g., a bermed Route 5 off the Skyway represented a “wall” between Buffalo’s downtown and her waterfront – never mind the river and the grain elevators. The Outer Harbor has now become an attractive, if unfinished, parkland enjoyed by thousands of people every year. The fought-over improvements to access Fuhrmann Boulevard, the attractive streetscape, and the new bike paths, beaches, and parks are the reason why. What was once a barren, poorly accessible wasteland is now an improved, accessible parkland. Today, we’re debating whether people might someday live there, and whether there might be things to do there besides recreate. I’ve long advocated for careful development on the Outer Harbor to give people an opportunity to live, work, and play along one of the most attractive spits of waterfront land in America. In the inaugural issue of the Public, Bruce Fisher makes the argument against development on the Outer Harbor, citing everything from the weather and wind to tax policy and housing values. It was the weather that led a Giambra administration to recommend the construction of a domed amusement park just a decade ago. About the weather and wind – Buffalo and her waterfront are not the most inhospitable places in the world. People live and buildings are constructed in the wind and cold throughout the world. If you take Fisher’s argument about how inclement the winter weather gets out there, then one would have to question the sanity of anyone living in places like Moscow, Helsinki, Stockholm, Reykjavik, Oslo, or other locations with climates as harsh – or worse – than our waterfront’s. After all, we’re talking about building attractive shelter, not a beachfront resort. Fisher’s argument is more persuasive on the tax policy and housing demand front. He chips away at the notion that residents on the waterfront will contribute to the tax base, pointing out how guys like Paladino build new developments with massive tax breaks. 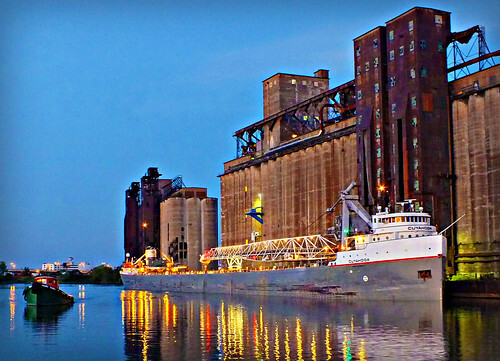 However, an influx of residents to Buffalo’s waterfront contributes to local economic activity in other ways. Sales taxes and other fees for goods and services will find their way to Buffalo rather than wherever these hardy, weather-immune pioneers came from. Fisher’s strongest point touches on the crisis of property abandonment throughout Buffalo. There are thousands of units of vacant, absent, or dilapidated housing throughout Buffalo’s neighborhoods, and prioritizing high-end luxury buildings on the waterfront when we have this other problem is, at best, unseemly. But the property we’re talking about on the waterfront is different from an east side bungalow in a few salient ways, not the least of which is the real estate mantra: location, location, location. What of that location? Listening to opponents of development on the Outer Harbor, you’d think that ECHDC was planning to mow down all the wetlands and parks and put up a sea of parking lots and concrete bunkers. But look at the renderings – there’s nothing but parkland all over the place, even in the ECHDC plan. The most contentious proposal involves construction along the Buffalo River, opposite Canalside. What’s there now, you ask? A parking lot for people’s drydocked boats and their cars; an eyesore. Here’s a presentation showing the three alternatives that the ECHDC proposed. Almost all of the building they’ve been talking about is on parcels that are now either parking lots, drydocks, or dilapidated concrete parks. The impact to greenspace is de minimis. Here is one of the ECHDC proposals. The development is limited to those areas that are already concrete lots, and it creates a huge swath of new publicly accessible parkland. Here’s another view of what the ECHDC is proposing. This seems to track “Alternative B”. For the areas they’re talking about developing, they’re already marred by crap. ECHDC seems to be saying, let’s replace the crap with something attractive and usable. I think Fisher’s piece contributes positively to a debate that we should be having about reuse of the Outer Harbor, and the abandonment point is an interesting one. But right now the choices being pushed to the public are to either build nothing at all, or accusing ECHDC of wanting to build a sea of Waterfront Villages out there to encroach on Times Beach Preserve. However, that’s not what’s happening. But why would we prohibit any development on these dilapidated, eyesore parcels in perpetuity based on current real estate and economic conditions? Cities all over the world have re-shaped their waterfronts in part due to the introduction of things to do and places to go. If the conditions are inhospitable in the winter, some shelter makes sense. Expanding Metro Rail down to the Outer Harbor makes sense. Even if ECHDC was to simply plan and zone the buildable parcels, get utilities down there, and then let private developers have at it through a transparent public auction, would that be a net negative for Buffalo? Maybe now isn’t the best time to build out there, but someday it might be. We should be careful about planning how it happens, but it should be allowed to happen.